Join us as Red Bull Music Academy & Soul’d Out Music Festival present the Bubblin 3 Year Anniversary. Since 2010, Bubblin has been one of North America’s definitive advocates for all sounds at the intersection of house, garage, techno and tropical bass. For the occasion we’re thrilled to present a line up of PDX debuts by two of the most incandescent talents to emerge in dance music in recent years: Hessle Audio Co-Boss and globally revered disk jockey Ben UFO and 100% Silk’s melodic deep house savant Octo Octa. We have also enlisted Fusebox’s glorious Funktion One rig and 3D projection mapped visuals by PDX’s Prism Labs to make sure the evening both sounds and looks beautiful. As one of the co-founders of Hessle Audio, Ben UFO has been responsible, alongside Pearson Sound and Pangaea, for some of the most varied and ground breaking releases of recent years. Having become immersed in the still emerging dubstep scenes in London and Leeds in 2005, his musical taste was shaped primarily by the DMZ and Sub Dub nights taking place in those cities. However, as tastes have shifted and scenes have fragmented, Ben UFO’s approach to the music and to Hessle Audio itself has developed. As BPMs have dropped and influences have broadened, so too has the vision of Ben UFO’s DJing. He remains one of the few DJs in the UK to have made an impact without a production career to fall back on, and as such his reputation is solely the result of his skill as a selector and as a mixer. As a result he remains in a position to fully explore sounds both old and new, across the worlds of house and garage, dubstep and grime, and further into the past. This level of commitment to the dance music of the last two decades has led to a collection of records which reflects the position London has long held as a city responsible for the constant development of forward thinking music. This is not to say that his focus is primarily on the sounds of the old school, as Ben UFO is looked to as one of the leading figures supporting up and coming producers. He was the first DJ to play material by producers such as Blawan and Joy Orbison, both now scene figureheads, and his biweekly slot on London’s leading ex-pirate radio station, RinseFM, is considered to be one of the only places to hear the most exclusive new music by both new and established producers. 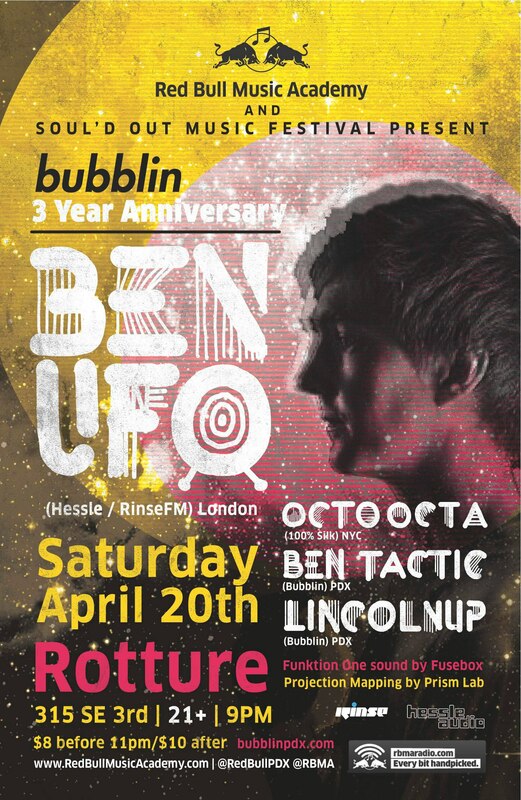 Ben UFO plays from 9PM – 11PM on RinseFM (www.rinse.fm / 106.8FM in London) every Thursday night. Octo Octa is Michael Bouldry-Morrison, a Brooklyn-based house music producer. Following the release of his debut EP “Let Me See You” on 100% Silk in 2011 – a release described by label head Amanda Brown (LA Vampires) as “literally one of the favorite songs ever released on either of my record labels” – he went on to produce three further releases for the label: ʻRough, Rugged, and Raw,ʼ ʻOh Love,ʼ and an eventual collaboration with Amanda Brown, the ʻLA Vampires by Octo Octaʼ release “Freedom 2K.” His singular brand of R&B-sampling deep and emotional house music has propelled him to the forefront of a scene of house-not-house producers garnering widespread critical acclaim in both traditional electronic music and indie-minded musical circles. Having recently been selected as a participant for the 2013 Red Bull Music Academy, a European tour scheduled for late 2012, and both a new EP and LP in the works, Octo Octaʼs ascent is imminent. This entry was posted on March 29, 2013 at 10:19 am and is filed under 100% Silk, Ben Tactic, Ben UFO, Bubblin, Hessle, Lincolnup, Octo Octa, Red Bull Music Academy, Rotture, Showtime!, Soul'd Out Music Festival. You can follow any responses to this entry through the RSS 2.0 feed. You can leave a response, or trackback from your own site.